Today, sixteen days after leaving Zhongshan Station, the Dome A traverse team are over 1,000 kilometres inland, and less than 200 kilometres from Dome A. Having attained an altitude of over 3,500 metres, oxygen levels are already much reduced and the temperature has dropped to below -30 degrees centigrade. Two days ago, on New Year's Eve, the team came across an AGAP (Antarctic Gamburtsev Province Project) refuelling camp and a support team of some eleven people and stopped a few hours to assist in maintaining a temporary runway for the Twin Otter aircraft carrying out the project's airborne survey of the Gamburtsev Subglacial Mountain Range. Meanwhile, after twelve days at sea and a crossing of over 3,000 nautical miles, the Xue Long will be sailing into Melbourne in just a few hours. There, I will disembark after a farewell Chinese dumpling party and eight weeks immersion in the 25th Chinese National Antarctic Research Expedition (CHINARE 25). The vessel will stay berthed at Melbourne for five days in order to load more cargo and building materials before sailing back south to Zhongshan on the 8th of January. If everything goes to plan, on the 26th of January, a delegation from six Chinese ministries will board a plane chartered from the German Alfred Wegener Institute (AWI), and fly from Zhongshan to Dome A, where they will stay for just a couple of hours to inaugurate Kunlun Station. The delegation will then fly back to the Russian station, Novolazarevskaya, and on to South Africa using the Antarctic Dronning Maud Land Air Network (DROMLAN). 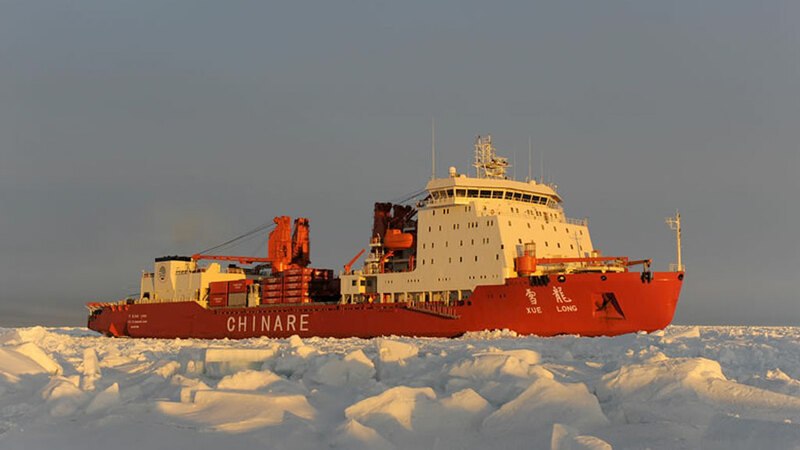 Once the unloading and refuelling of Zhongshan Station is completed, the Xue Long will sail to the Amery Ice Shelf and Prydz Bay region for a two-week scientific research cruise within the context of the Chinese IPY PANDA programme. From there, it will return to Zhongshan to pick up the Dome A team, which should have arrived back at the station, and finally sail back to its home port of Shanghai, where it is due to arrive around the 10th of April 2009 - almost six months to the day after its departure. In the true spirit of the International Polar Year and of the Antarctic Treaty, my journey to Antarctica accompanying CHINARE 25 has been a model of openness and hospitality. It serves as yet another (albeit small) example of how the Antarctic is able to draw people together and break down barriers: A realm apart, Antarctica dances to a different tune. Somehow, it still seems able to harbour basic values of trust and cooperation that often seem difficult to achieve in the "real world." "I will have learned a great deal more about the Chinese people by spending two months as a member of CHINARE than if I had spent that same amount of time in China." I have no doubt that this is true, and here again, Antarctica seems a privileged vessel for distilling and focusing on the essential. I have also made new friends, and through them, discovered the resilience and perseverance of the people who make up this programme. Indeed, CHINARE is still at that exciting stage where it is small enough to keep a human face and a true sense of shared exploration and adventure, yet mature and ambitious enough to want to deliver some of the most valuable science from Antarctica. Other nations may have older Antarctic histories, or have already accumulated many years of experience operating inland research stations, but watching CHINARE 25 leaves me in no doubt that China is rapidly catching up. The foundations it is laying down during this IPY, especially at that exceptional and most promising of locations, Dome A, should enable it and its international partners to contribute the kind of scientific advances that will become the benchmarks of tomorrow. It is the same quest for understanding that, since the International Geophysical Year (IGY) of 1957-58, has lured scientists to the South Pole, to Dome C, Dome F, Vostok, and to so many other inland and coastal locations across Antarctica. As with its emerging space programme, but on a more modest scale, China's growing fascination with Antarctica as a physical and scientific frontier exemplifies its desire to open up and to take its place at the leading edge of human endeavour. But to secure this momentum beyond the IPY and for decades to come, it also needs to keep providing its young generation of polar researchers with enough structures and opportunities to communicate and collaborate with their peers internationally. My journey to Antarctica accompanying CHINARE 25 has been a model of openness and hospitality.